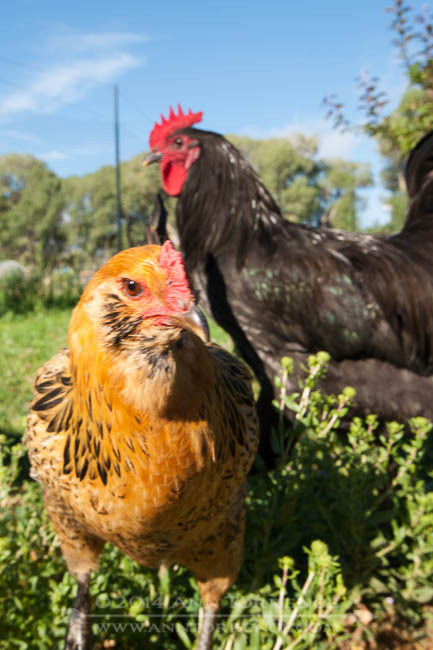 Ameracauna hen from this year's first batch of chicks raised on pasture, watched over by Apollo, the Jersey Giant rooster. Frugal is a word I fully grasp, so when it came time to make some rain and shade shelters for our animals, it wasn’t going to be elaborate. But it wasn’t going to be flimsy either – goats will destroy anything they can get their mouths around. And they needed to be somewhat portable, because we want to move the goats around to eat what needs eating. 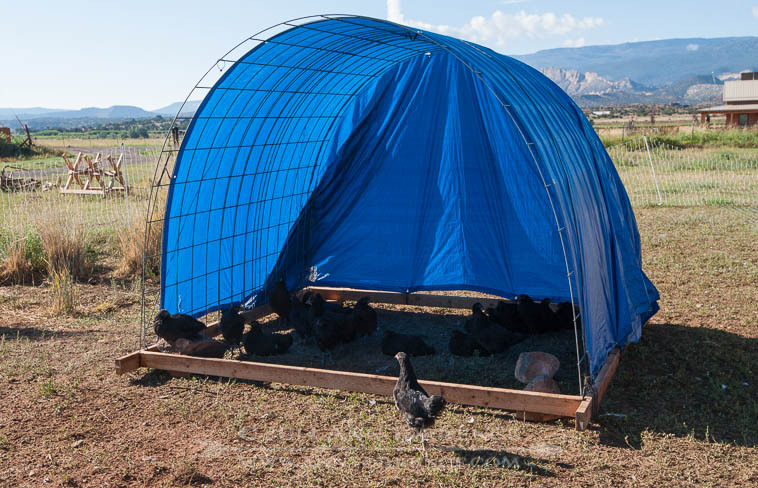 I saw somewhere on the interwebs that folks were making chicken coops out of livestock panels, and realized we could turn this into a general purpose idea. The second batch of chicks using a mobile shelter for shade. on this version, we overlapped the panels but did not trim down the base 2x4. The excess timber works as an additional grab point when moving the structure and a convenient anchor point for sand bags, missing in this photo. 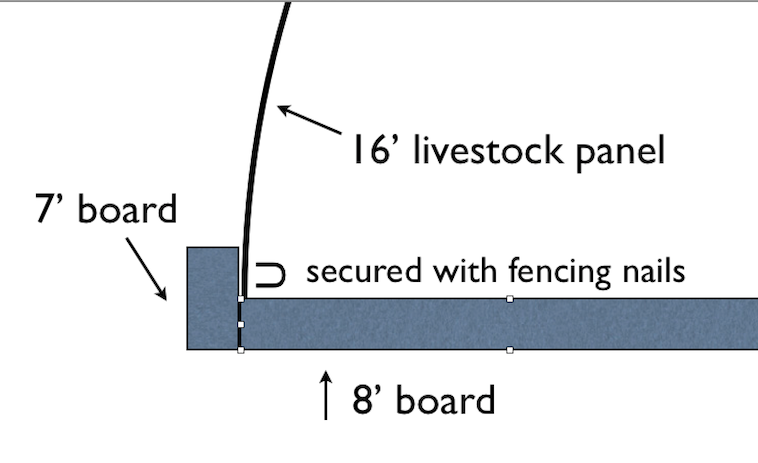 The basic plan is to build a rectangle out of four 2×4 boards and two 4′ x 16′ livestock panels. For this application, the cheaper ones are better, easier to bend. The panels overlap by a foot to add rigidity, so I cut two of the boards to 7′, the other two are just standard 8′ lengths. We add some corner braces to counteract the tension of the panels. Fencing nails (barbed and shaped like a U) secure the panels to the inside of the frame. We cable tie the two panels together then add a tarp. A 12×16 tarp will make a three sided cover to the ground; the goats got a 6×8 tarp that they couldn’t reach to destroy. Because we are dealing with winds that regularly exceed 40mph, we add some guy ropes over the tarp, which adds some rigidity to the structure as well. The lip created by the way the 2x4s are butted together gives a more solid base for the livestock panel to push against. In our winds, lest we simply launch a wonky and dangerous parasail kite craft across the orchard, once in place we weight it down with whatever’s available. Sandbags would be ideal, but we have used large rocks and buckets of water. If we really wanted to permanently locate it somewhere, I could imagine securing it with something like duckbill anchors, but I like the flexibility of being able to move it wherever I need it. Now that we have a couple of these around, I see no reason to produce anything more costly to keep things and critters out of the weather. In fact, our next project is to build two longer versions, at least 3 panels long, to shelter hay and firewood. And in my next installment, I’ll show how we used one to create a deluxe mobile chicken coop, a contraption we call the Chickestoga.